The female Yangtze giant softshell turtle (Rafetus swinhoei) died at the Suzhou Zoo in Suzhou, China a day after an attempt at artificial insemination, part of an effort to help save its species from extinction. The death means only three giant softshell turtles remain in the world. The city government said in a statement that experts have already used technology to collect the turtle’s ovarian tissue for future research. The world’s rarest turtle, Yangtze Giant Softshell Turtle, saw one more death at Suzhou Zoo, E.China’s Jiangsu on Sat. The death of the only known female in China increases the extinction risk of the species, whose population now drops to three (1 in China, 2 in Vietnam). The Suzhou zoo is home to another Yangtze giant softshell turtle — a male. Two others live in Vietnam, but they are both thought to be males. According to state-run newspaper People’s Daily, the turtle had been inseminated five times since 2008. Although the last insemination was said to have gone smoothly and the turtle appeared to be in fine health after the procedure, her condition deteriorated the following day. In 2015, scientists from the Turtle Survival Alliance (TSA), San Diego Zoo Global, and Wildlife Conservation Society’s (WCS) Bronx Zoo, assisted in an attempt for artificial insemination, in what was then called a “last chance” to breed the rare turtle. The female turtle was transferred to Suzhou Zoo from Changsha Ecological Zoo in 2008 to be paired with the male, believed to be more than 100 years old, as part of a captive breeding program designed to recover the species. Although the two turtles have displayed courting behavior, eggs laid by the female were infertile. Listed at the top of the IUCN’s Red List of Threatened Species, as critically endangered, the Yangtze giant softshell turtle is the most critically endangered turtle in the world. Much of its demise has been attributed to over-harvesting and habitat degradation. China’s latest monkey cloning experiment has sparked outrage and been labeled “monstrous” by animals welfare advocates. Researchers said the monkeys demonstrated increased anxiety and depression, reduced sleep time, and even “schizophrenia-like behaviors,” according to a pair of papers published by the scientists in the National Science Review. “Disorder of circadian rhythm could lead to many human diseases, including sleep disorders, diabetic mellitus, cancer, and neurodegenerative diseases, our BMAL1-knock out monkeys thus could be used to study the disease pathogenesis as well as therapeutic treatments” said Hung-Chun Chang, senior author and investigator of the Chinese Academy of Sciences Institute of Neuroscience in a statement. “The genie’s out of the bottle now,” said Jose Cibelli at the time, a cloning expert at Michigan State University in the US. It’s important to note that because primates share approximately 95 percent of human genes and a number of physiological and anatomical similarities, biomedical research currently uses a large number of monkeys, sometimes up to 100,000 annually around the globe. “This number will be greatly reduced by the use of monkeys with uniform genetic background that reduces the noise in experimental studies,” Dr. Poo said, pointing to the example of testing drug efficacy before clinical trials. The gene-edited monkey clones come hot on the heels of a rogue Chinese scientist announcing he used CRISPR technology to create the world’s first gene-edited human babies. This story is part of the ‘Reporting the Online Trade in Illegal Wildlife’ programme, a joint project of the Thomson Reuters Foundation and The Global Initiative Against Organized Crime funded by the Government of Norway. Tiger bone, bear bile, deer musk and pangolin scales are all prized ingredients in traditional Chinese medicine. They also come from some of the most endangered species of animals on earth, whose international trade is protected by the Convention on Illegal Trade in Endangered Species of Wild Fauna and Flora (CITES). But on Chinese social media and e-commerce platforms, their sale is still rife. For instance, deer musk, an odorous secretion from the male musk deer, is believed by the Chinese to be of high medicinal value. Over the past 50 years, the poaching of musk deer has been so rampant in China that their population has shrunk by more than 90 per cent. Although the government gave the species class I protection status in 2003, it is still allowing more than 10 pharmaceutical companies to legally use natural musk – either from their own stockpiles or farmed musk deer – in nearly 20 products. It is easy to buy illegal raw musk on the internet too. On Alibaba’s 1688.com and Taobao, at least a dozen postings can be found offering to sell raw musk pods or powders – ostensibly from Qinghai or Tibet – all without proper documentations, including a special label required to be displayed on the packaging of legal products. Most of the sellers are based in Bozhou, Anhui, which is dubbed one of the “four medicinal capitals of China”. Advertised as “healthy and nourishing,” these items have been sold to at least 5,000 people according to the number of reviews left by buyers. These online transactions are illegal and completely “off the books”, admits one seller. “Products with proper documents cost twice as much,” he says. “They are only crude drugs. I don’t need a licence to sell farm produce,” another trader argues, before abruptly hanging up when questioned about musk deer being a Class I protected species. According to officials at the Chinese State Forestry Administration, Anhui Forestry Department and Bozhou Forestry Bureau, it is illegal to trade raw musk without approval or to sell it to retail customers, while legal pharmaceutical products that contain deer musk must bear a special label issued by the government. Alibaba has now removed listings that mention natural musk in their descriptions from 1688.com and Taobao following an enquiry from FactWire. “We will also continue to take action against sellers who violate laws or our product-listing policy,” a spokesperson says. In November last year, Chinese internet giants Baidu, Alibaba and Tencent joined forces with eight other e-commerce companies to launch a massive campaign, vowing to curb the rampant online sales of endangered wildlife. But its effectiveness is questionable. On Baidu Tieba, a Chinese discussion platform similar to Reddit, keywords such as rhino horns, antelope horns and bear gile, which are banned from sale in China, are directly blocked from appearing in search results, but adverts for endangered wildlife parts can still be found by adding words like curio or crude drugs, or using their homophonic characters or pinyin. Buyers and sellers typically hide their identity by only leaving their usernames on Wechat in the adverts and transacting through online payment methods and courier services. One seller on Wechat can offer deer musk, bear bile, tiger bones and antelope horns, while flaunting them as a cure for everything; Another seller claims to be a wooden furniture merchant but is able to source frozen or live pangolins and their scales from Vietnam and Laos. “They are all freshly killed,” he boasts on the messaging app. Thanks to an insatiable demand for wild animals in China, illegal poachers, traffickers, smugglers and sellers from all corners of the country have formed a powerful supply chain. The trafficking of pangolins, for example, is very difficult to track. In one case that happened between 2013 and 2014, the defendant paid three groups of smugglers to move 2,200 pangolins from Vietnam across the border into Guangxi using boats and motorcycles, and then delivered them to Guangdong using private vehicles. The habit of eating wild animals stretches back centuries in China and is very much part of the Cantonese cuisine. After the 2003 SARS outbreak, which was initially thought to originate from exotic animals – such as palm civets and raccoon dogs – the provincial government stepped up its efforts to curtail wildlife consumption by banning party members and officials from eating them. But such discouragement has so far proven to be futile. For many years Yiyun has teamed up with other volunteers, going undercover as diners and reporting these restaurants to authorities. In one operation in March they found two ailing pangolins, which were believed to have been force-fed water to increase their weight, in order to fetch a higher price. “It was upsetting, I was still holding it in my hand… The pangolin is a slow and shy species. it will just curl up into a ball when it is attacked, so its life is very fragile,” he laments. According to the observations of Yiyun and another volunteer who goes by the name Yuexin, in every Chinese city there are at least 10 black markets that supply wild animal parts to nearby restaurants. These marketplaces are typically used for legal agricultural wholesale in daytime but are converted into seedy wildlife markets at night. Last year, volunteers successfully tracked down pangolin traffickers to a poultry trading market in Guangzhou, which has since been shut down following media reports. But some appear to have stayed behind. In dark and empty streets, a few mini lorries typically used for transporting wild animals can still be seen parked next to what used to be wildlife shops. Within minutes, one lady has turned up in her motorcycle in suspicion. More than an hour’s drive away is another market called the Furong agricultural wholesale market. At midnight, the air reeks of animal flesh and feces; wild sounds echo through dimly lit shops. Inside cages lining the corridors are live wild animals like porcupines and masked palm civets – both are protected species but can be legally sold with licences – and many more that are indistinguishable in the dark. These shops only display legal wild animals at the front and keep endangered species like pangolins hidden. To conduct a trade, buyers often place an order on Wechat first. They will then park deep inside the market at night and directly transfer the animals from one vehicle to another. For years activists in China has been promoting the message that “when the buying stops, the killing can too”, but many now fear that the government’s recent reboot of its wildlife law in 2017, which has provisions that allow for endangered animal farming and trading for medicinal use, has left loopholes for the use of wild animal parts that were originally tightly restricted to thrive again. For example, although in 2016 the critically endangered pangolin was elevated to CITES Appendix I – the highest protection status, the use of pangolin scales is still legal in 700 Chinese hospitals and around 70 medicines manufactured by authorised drug companies. Activists have criticised the lack of transparency about their sales volume and inventory, which enables smuggled scales to enter the market easily. Processed pangolin scales are also still commonly sold in pharmacy chains in China. In a chemist in Guangzhou, a salesperson says these scales not only can reduce swelling, but also help with lactation and blood circulation. However, according to Professor Lao Lixing, director of the School of Chinese Medicine at the University of Hong Kong, many animal-based remedies were historically only based on the shapes and behaviours of the animals. “For example, people used to believe pangolins, which dig through the ground using their claws, can help blood circulate; Or since tigers are strong, they must have extraordinary health benefits too,” he says. Lao, who has also studied western physiology, believes that animal parts should no longer have a place in traditional medicine. “First, there are many substitutes for animal parts. Second there is no proof that animal-based remedies are better than other methods. Third, even if animal parts are proved to be useful, human beings should not put their self-interest above the welfare of animals,” he says, adding that the perceived health benefits of pangolin scales, for instance, can be replaced by more than 20 medicinal herbs. Lao lambasts that traffickers would exaggerate the benefits of wild animal parts in order to extract higher prices, for example by concocting folk remedies like pangolin meats and pangolin blood with rice, which have no medical evidence. According to the International Union for Conservation of Nature, a total of one million wild pangolins were poached and illegally traded globally between 2004 and 2014. Trafficking of pangolin parts has remained rampant despite repeated crackdowns, with Hong Kong being an important port in the entire value chain. According to government data, between 2015 and August 2018, Hong Kong customs officials seized over 45 tonnes of pangolin scales estimated to be worth more than HK$80m – meaning that at least 22,000 pangolins were slaughtered in three years, given that one can produce about 500g of scales. The smuggling of pangolins has shown no sign of abating: in the first eight months of 2018 alone, Hong Kong has seized a total of 16 tonnes – the highest figure in five years – including 11.7 tonnes found hidden in several 40-foot shipping containers originated from Nigeria in three separate seizures. “Demand for pangolin scales is low in Hong Kong, so these specimens were probably destined for neighbouring areas such as mainland China,” says Chan Tsz-tat, head of the Customs and Excise Department’s ports and maritime command. These successful seizures and convictions only represent the tip of the iceberg, considering the scale of the illegal wildlife trade. In Hong Kong, for instance, only 20 cases involving the smuggling of pangolins were successfully prosecuted between 2014 and early 2018, with the most severe penalty being two months of imprisonment. Taking a stronger stance against endangered wildlife trafficking, the Hong Kong government has recently updated its law to increase the maximum penalties from a fine of HK$5m to HK$10m and from two years of imprisonment to 10 years. Meanwhile in China, the government has finally upped the ante against the booming online wildlife trade. For example in last year’s revision of the wildlife protection law, e-commerce platforms were for the first time made liable for any illegal wild animal goods sold by vendors on their websites. These platforms and online traffickers were also targeted earlier this year in a nationwide enforcement campaign, which, in one case, saw a man in Guangzhou arrested for allegedly selling 168 protected wild animals online, including a globally threatened rhinoceros iguana. But for the volunteer groups that investigate the illegal sales of wild animals – both on or off the internet – it remains dangerous work. Both Yiyun and Yuexin have received threatening calls and messages, so they must be careful in every operation. “The truth is, some government officials don’t like us, the public don’t understand us. There is pressure everywhere,” Yuexin says. This story was produced by FactWire written as part of the ‘Reporting the Online Trade in Illegal Wildlife’ programme. This is a joint project of the Thomson Reuters Foundation and The Global Initiative Against Organized Crime funded by the Government of Norway. More information at http://globalinitiative.net/initiatives/digital-dangers. The content is the sole responsibility of the author and the publisher. His new series, Dynasties, will mention the pressures affecting wildlife, but Attenborough makes it clear that it will play them down. To do otherwise, he suggests, would be “proselytising” and “alarmist”. His series will be “a great relief from the political landscape which otherwise dominates our thoughts”. In light of the astonishing rate of collapse of the animal populations he features, alongside most of the rest of the world’s living systems – and when broadcasting as a whole has disgracefully failed to represent such truths – I don’t think such escapism is appropriate or justifiable. It is not proselytising or alarmist to tell us the raw truth about what is happening to the world, however much it might discomfit us. Nor do I believe that revealing the marvels of nature automatically translates into environmental action, as the executive producer of Dynasties claims. I’ve come to believe it can have the opposite effect. For many years, wildlife film-making has presented a pristine living world. It has created an impression of security and abundance, even in places afflicted by cascading ecological collapse. The cameras reassure us that there are vast tracts of wilderness in which wildlife continues to thrive. They cultivate complacency, not action. You cannot do such a thing passively. Wildlife film-makers I know tell me that the effort to portray what looks like an untouched ecosystem becomes harder every year. They have to choose their camera angles ever more carefully to exclude the evidence of destruction, travel further to find the Edens they depict. They know – and many feel deeply uncomfortable about it – that they are telling a false story, creating a fairytale world that persuades us all is well, in the midst of an existential crisis. While many people, thanks in large part to David Attenborough, are now quite well informed about wildlife, we remain astonishingly ignorant about what is happening to it. What makes Attenborough’s comments particularly odd is that they come just a year after the final episode of his Blue Planet II series triggered a massive effort to reduce plastic pollution. Though the programme made a complete dog’s breakfast of the issue, the response demonstrated a vast public appetite for information about the environmental crisis, and an urgent desire to act on it. I later discovered that this response was typical. The controllers weren’t indifferent. They were actively hostile. If you ask me whether the BBC or ExxonMobil has done more to frustrate environmental action in this country, I would say the BBC. We all knew that only one person had the power to break this dam. For decades David Attenborough, a former channel controller widely seen as the living embodiment of the BBC, has been able to make any programme he wants. So where, we kept asking, was he? At last, in 2000, he presented an environmental series: State of the Planet. It was an interesting and watchable series, but it left us with nowhere to go and nothing to do. Only in the last few seconds of the final episode was there a hint that structural forces might be at play: “Real success can only come if there’s a change in our societies, in our economics and in our politics.” But what change? What economics? What politics? He had given us no clues. To make matters worse, it was sandwiched between further programmes of his about the wonders of nature, which created a strong impression of robust planetary health. He might have been describing two different worlds. Six years later he made another environmental series, The Truth About Climate Change. And this, in my view, was a total disaster. It told us nothing about the driving forces behind climate breakdown. The only mention of fossil fuel companies was as part of the solution: “The people who extract fossil fuels like oil and gas have now come up with a way to put carbon dioxide back underground.” Apart from the general “we”, the only distinct force identified as responsible was the “1.3 billion Chinese”. That a large proportion of Chinese emissions are caused by manufacturing goods the west buys was not mentioned. The series immediately triggered a new form of climate denial: I was bombarded with people telling me there was no point in taking action in Britain because the Chinese were killing the planet. There had not been a famine in Ethiopia for 28 years, and the last one was caused not by an absolute food shortage but by civil war and government policies. His suggestion that food relief is counter-productive suggests he has read nothing on the subject since Thomas Malthus’s essay in 1798. But, cruel and ignorant as these comments were, they were more or less cost-free. By contrast, you do not remain a national treasure by upsetting powerful vested interests: look at the flak the outspoken wildlife and environmental presenter Chris Packham attracts for standing up to the hunting lobby. I have always been entranced by Attenborough’s wildlife programmes, but astonished by his consistent failure to mount a coherent, truthful and effective defence of the living world he loves. His revelation of the wonders of nature has been a great public service. But withholding the knowledge we need to defend it is, I believe, a grave disservice. As Chinese companies make inroads into Bolivia for infrastructure and resource extraction, locals have found that they can earn up to $215 selling jaguar fangs to Chinese employees. This new demand has now inspired hunters to go into the Amazon jungle to hunt commercially. Sadly, that is part of a trail of blood spattered across the planet, taking the shape of Chinese characters for trinkets and various “traditional medicines” that spell out ivory, rhino horn, jaguar fangs, swim bladder, shark’s fin and a host of other ghastly products. The color red signals danger in primates and in many human cultures, but in China it symbolizes good luck. The seas, forests, plains, and deserts of the world are now soaked in blood thanks to an ancient demand for wildlife parts to cure human maladies and to serve as status symbols that sadly have been found to have no medicinal value by scientific tests. That’s one narrative, but there is another, something more sinister than primitive superstition: eat it because it’s exotic. This is going on every day, all over the world. Jaguar fangs in the end market in China are worth as much as their weight in cocaine. National Geographic recently published a stunning article about how the cats are “killed to order” in Suriname for the overseas Chinese market. A scientist I know who works in the tropical forests of Guyana, far from Bolivia on the north coast of South America, says he has heard that local hunters are in touch with Chinese agents in country’s capital city of Georgetown to procure jaguars. If it’s happening in Bolivia and also in Suriname and Guyana it’s easily conceivable that jaguars are being hunted for their fangs everywhere in between across the Amazon basin. The King of the Amazon, it seems, is nothing more than a potential gaudy trinket for China’s nouveau riche to hideously flaunt. Chinese state-owned companies have sunk their fangs into forests adjacent to Ecuador’s Yasuni National Park—called the world’s most biodiverse ecosystem by scientists—while just last year Chinese poachers were arrested at sea with 300 tonnes of endangered sharks in Ecuadorian waters. That illegal haul equaled 6,000 sharks and the crew of 20 Chinese poachers were given sentences of up to four years in prison. In fact, Chinese demand for shark’s fin basically blankets the planet. In 2016, a staggering 8 million dead seahorses were intercepted in Peru bound for China. Farther down on the South American continent in Argentina a Chinese poaching vessel was caught (and later destroyed) carrying 180 tonnes of illegally caught squid in Argentinean waters. And Chinese appetite for South America’s wildlife is not limited to the surf and turf, but also the skies. In 2016 HK$2 million worth of wild and illegally-imported macaws were intercepted by marine police and customs officers before they could be offloaded in Shenzen. If the Amazon railway that China envisions for South America ever becomes a reality, linking the Atlantic and Pacific Oceans, wildlife poaching and deforestation will no doubt rapidly increase. The same can be said of the proposed and China-backed Nicaragua Canal if that ever happens. Farther out to the east in the Caribbean Sea, Chinese appetite for rare land turtles—as well as sea turtles—was documented in the late Archie Carr’s classic book The Windward Road. Carr followed up a report that a Chinese merchant in Trinidad was in possession of a rare yellow-footed tortoise(Carr classified it as Testudo denticulate at that time). Carr eventually procured the tortoises. That was in Trinidad in the 1940s, and what it shows is that there is no place that is too far away or obscure for Chinese demand for wildlife, and there never has been. Farther north in Canada, a bear poaching ring was recently broken up and the customers of these illicit Canadian gunslingers were those seeking bear gallbladders on the Asian market. 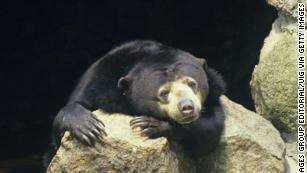 South of the border, two Michigan men were arrested for poaching black bears to sell to the traditional Chinese medicine market. Even in North America, bears are not safe from Chinese demand for their gallbladders. Chinese mining companies threaten wildlife habitats as far afield as Greenland. Exploitation of Africa has been well-documented, with elephant herds and rhinoceros populations plummeting in recent years thanks to Chinese as well as Vietnamese demand. Nonetheless, it’s worth mentioning some specific cases here. Gabon’s forest elephants are coming under major pressure for their ivory, which will be shipped to China if the great beasts are unfortunate enough to encounter a poacher, and the same goes for the elephants of Mozambique, Botswana, Kenya, Ethiopia, and every other African nation that has elephants, ditto for rhinoceros. Off the coast of West Africa, Chinese fishing (poaching) vessels are clearing out the sea of any and all fish species. They are literally robbing African fishermen of their livelihoods. Ploughshare tortoises in Madagascar are rounded up and snuck onto flights bound for China. The number of African pangolins being hunted and sent to China is simply mind-blowing. Chinese infrastructure projects in Africa, like the new train line in Ethiopia, will, in addition to spurring the bush meat trade as it did in Namibia and elsewhere, also drive resource extraction and environmental degradation. There is simply no end in sight. A stack of heavy books could be written on Chinese consumption of wildlife in South America, North America, Africa, South Asia, Southeast Asia, Northeast Asia, and everywhere in between (even tiny Palau has the Herculean task of chasing away Chinese and Taiwanese fishing vessels). And when Chinese nationals are caught by local authorities for engaging in the wildlife trade, what happens? It seems that if you throw a bunch of money their way, freedom is yours, as was the case in Suriname when Chinese nationals caught with jaguars were “fined” and then walked away. If this is how justice is carried out across the globe, and especially in the tropics, there won’t be much left of the world’s natural heritage in the not-too-distant future. The Hornbills’ numbers are crashing and in a few short years have been downgraded from Vulnerable to Critically Endangered by the IUCN. The Chinese are after their heads, literally. Their solid red casques are considered “red ivory” They are actually made of keratin, the same stuff as your fingernails and, incidentally, rhino horn, and rhinoceros are another species which have been virtually wiped off the face of the Southeast Asian map thanks to a misplaced belief that ground rhino horn can cure cancer and a host of other human ailments. The ghastly trade in elephant skins from Myanmar has been driven largely by Chinese demand, as is so often the case for wildlife products from the region, and Burmese timber continues to make its way into Yunnan. Much has already been written about the Chinese enclave in northern Laoswhere casinos also serve up barbecued tiger, bear, and other protected species. One can only imagine what is being taken out of the surrounding seas and forests in the Chinese enclaves of Sihanoukville and Koh Kong in Cambodia, not to mention the South China Sea. BEIJING/CHICAGO/CARAMBEI, Brazil (Reuters) – Ken Maschhoff, chairman of the largest U.S. family-owned pork producer, has watched profits fall as trade tensions rise between the United States and China. His company, The Machhoffs, has halted U.S. projects worth up to $30 million and may move some operations overseas. Investing in domestic operations now would be “ludicrous” as China and others retaliate against U.S. agricultural goods, Maschhoff said from the firm’s Carlyle, Illinois headquarters. Across the globe, Chinese pig farmer Xie Yingqiang sent most of his 1,000-pig herd to slaughter in May to limit losses after Chinese tariffs on U.S. soybeans hiked feed prices and left him unable to cover his costs. “It did not really make sense to keep raising them,” said Xie, from eastern Jiangsu province. The dueling salvos of the U.S.-China trade war are landing particularly hard on the pork industries of both nations – and spraying shrapnel that has damaged other major pork exporters such as Brazil, Canada and top European producers. In contrast to many industries that trade war has divided into winners and losers, the world’s pork farmers and processors are almost universally shedding profits and jobs from a crippling combination of rising feed costs and sinking pig prices. The key reason: The trade war came at precisely the wrong time, after a worldwide expansion to record pork production levels on the expectation of rising meat demand and low feed prices from a global grains glut. In the United States, meat companies such as Seaboard Triumph Foods (SEB.A) and Prestage Farms have spent hundreds of millions of dollars boosting U.S. slaughter capacity by more than 10 percent from three years ago to nearly half a million hogs daily. Just before trade barriers went up, the U.S. Department of Agriculture (USDA) predicted in an April analysis that global supply growth would outpace demand this year, sparking “fierce competition and lower prices.” Tariff battles accelerated those trends by shutting off export markets, raising feed prices and upending regional supply-and-demand dynamics that underpinned industry profits. U.S. pork faces retaliatory duties of 62 percent in China and up to 20 percent in Mexico, slashing demand from two top U.S. pork export markets and contributing to a mountain of unsold meat in cold storage. The USDA said in a statement that pork producers soymeal costs have declined because of a surplus of domestic soybeans that China is no longer buying. The Trump administration is working to increase opportunities for U.S. agriculture with the European Union, Japan and the United Kingdom, the agency said. In China, tariffs on U.S. soybeans and an outbreak of African swine flu have driven farmers to send hogs for an early slaughter, exacerbating a glut that followed the rapid expansion of more efficient, large-scale farms in recent years. Higher domestic supply and rising imports from other suppliers, such as Spain and Brazil, has compensated for the slide in U.S. pork imports. But an African swine fever outbreak this year has added to the problems of China’s pork producers. More than 40 cases have been reported in 13 provinces so far, and restrictions on hog transportation to control the disease have resulted in a glut in some northern provinces and a shortage in the south. Brazil’s pork industry has suffered higher feed prices partly because farmers now must compete with major Chinese soybean buyers who turned to Brazil to avoid tariffs on U.S. beans. In Canada, the world’s third largest exporter, producers’ fortunes have fallen along with the U.S. because their prices are tied to that much larger market. In August, prices fell 31 percent less than the previous month, according to data compiled by Hams Marketing Services. Manitoba farmer George Matheson now expects to sell his about 250 pigs for C$115 per head – well short of the C$150 it costs to raise them. “I had a hunch this would not be a good thing,” his said of the trade disputes. Many farmers in China are searching for cheaper protein-rich ingredients to replace soymeal, such as rapeseed or yellow peas. Big producers are also being hit hard. Hong Kong-based WH Group (0288.HK), the world’s top pork producer, which also owns U.S. giant Smithfield, warned earlier this year that its biggest challenge is the oversupply of meat in the United States and uncertainty over trade tensions. Top Chinese producers Muyuan Foods Co Ltd (002714.SZ), Guangdong Wens Foodstuff Group Co Ltd (300498.SZ) and Beijing Dabeinong Technology (002385.SZ), reported their worst earnings in years in the second quarter due to weak hog prices. Dabeinong also blamed high raw material prices for eroding margins in its feed business. “At least I can guarantee I don’t lose money this way,” he said. In Iowa, the top U.S. pork-producing state, trade disputes will cause hog farmers to lose $18 per head, or $800 million in total revenue from August 2018 to July 2019, Iowa State University economists predicted in September. For The Maschhoffs, the estimated loss equates to $100 million. “We were going to make money in ‘18 and ‘19, and now we’re going to have a red year,” Maschhoff said. The company considered investing in China, Eastern Europe and South America in recent years but shelved the plans because they could more efficiently raise pigs in the United States. “We’re starting to scratch our heads and say, ‘Did we make the right decision?’” he said. Producers have scaled back expansion plans because of the trade war, said Barry Kerkaert, a vice president at Minnesota-based Pipestone System, which annually sells farmers about 250,000 sows. In Lone Rock, Iowa, a town of about 200 people, Roger Cherland raises 3,000 sows. Housed in long barns, the swine jostle for space next to feed bins topped off by machines. The Cherlands’ hogs fetched about $40 per hundred pounds in August – about $20 less than their break-even price. “We’ve got way too many pigs right now,” Cherland said of U.S. farmers. In Europe, big pork exporters such as Spain and Germany, have made some additional sales to China and Mexico since the trade wars escalated this year. But the new sales have not been enough to support EU prices because of expanded domestic supply and because China bought less pork earlier this year than in past years. Pig farmers in Brazil, the world’s fourth largest producer and exporter, also might have been well-positioned to capitalize on a U.S.-China trade war by boosting sales to China. But that has hardly offset the damage from higher feed prices and a host of domestic problems that are hurting exports, driving up domestic supply and slashing prices. Russia, which until recently bought nearly 40 percent of Brazilian pork exports, imposed a ban in December after discovering traces of the prohibited food additive ractopamine. And the European Union banned imports from 20 Brazilian meat plants, mainly poultry suppliers, due to alleged deficiencies in the nation’s health inspection system. Brazil’s pig farmers normally can buy cheap local soybeans, a key ingredient in animal feed, because the nation is the world’s second-largest soy producer – but now they pay record prices in part because of the rush of Chinese buyers. Wilant Boogaard, a hog farmer in Paraná, operates as a member of a cooperative, a scheme that guarantees his production costs are covered by an associated meat processor. But as partners in the processing business, the cooperative’s farmers have a 40 percent stake, leaving them on the hook for losses. Deadly bird flu Deadly bird flu H7N9 is spreading all over the world cause China is refusing to give virus samples to United Kingdom and US in order to produce vaccine. As it was known Chinese authorities have refused to give sample of the virus cause it possibly breaks WHO rules. Deadly worlwide pandemic will be caused by a stain of bird flue,as experts warn cause the country is decreasing efforts to product vaccines. As it was also reported UK and US have tried to convice China in order to get the virus H7N9 samples in order to protect humans from the disease. The virus H7N9 is not causing symptoms to birds but to humans could have deadly results. Tests have shown that it could cause caughing fever, breathing problems, pneumonia or organ failure and worst of all could have deadly results. WHO earlier this year ranked the bird flu as one of the major pandemic treats. CHINA is endangering millions of lives and could cause of a global pandemic by refusing to share the latest strain of deadly bird flu with British scientists, experts have warned. Countries are usually happy to share viral samples in the common interest of stopping the spread of dangerous viruses, under an agreement established by the World Health Organisation. But China has so far caused outrage by refusing to do this, despite a request reportedly made more than a year ago by top British scientists. There have been at least 1,625 cases of H7N9 in humans so far in China. About 40 per cent of those people infected have died. The UK and United States have prioritised gathering as much intelligence as possible on the virus, which England’s deputy chief medical officer warned is a strong candidate for becoming the next global flu pandemic. The virus cannot currently be passed from one human to another, and most people infected so far came in to close contact with poultry. However, it is said to be only a few mutations away from being able to transfer between humans. If this was to occur then scientists fear the virus could could become as deadly as the 1918 Spanish flu, which killed up to 100 million people a century ago. They want to study any changes in its genetic structure, to help develop a vaccine as quickly as possible. China reportedly shared early forms of H7N9 in 2013 and 2016 with other countries. But a request said to have been made by the UK more than a year ago – for samples of the latest strain – was said by a source to have been ignored. China has also snubbed approaches from the USA for over 12 months. The virus was first identified in humans in 2013, but may have been common among birds for much longer. It generally does not have a visible affect on birds, but symptoms among humans include a high fever, cough and shortness of breath. Those with the severe form of the disease develop acute respiratory distress syndrome – where the lungs cannot provide the body with enough oxygen – septic shock and multi-organ failure. China was said to have given no reason for its failure to share samples of the virus with other countries. Despite an international agreement, U.S. health authorities still have not received H7N9 avian flu specimens from their Chinese counterparts. For over a year, the Chinese government has withheld lab samples of a rapidly evolving influenza virus from the United States — specimens needed to develop vaccines and treatments, according to federal health officials. Despite persistent requests from government officials and research institutions, China has not provided samples of the dangerous virus, a type of bird flu called H7N9. In the past, such exchanges have been mostly routine under rules established by the World Health Organization. Now, as the United States and China spar over trade, some scientists worry that the vital exchange of medical supplies and information could slow, hampering preparedness for the next biological threat. The scenario is “unlike shortages in aluminum and soybeans,” said Dr. Michael Callahan, an infectious disease specialist at Harvard Medical School. Experts concur that the world’s next global pandemic will likely come from a repeat offender: the flu. The H7N9 virus is one candidate. Since taking root in China in 2013, the virus has spread through poultry farms, evolving into a highly pathogenic strain that can infect humans. It has killed 40 percent of its victims. If this strain were to become highly contagious among humans, seasonal flu vaccines would provide little to no protection. Americans have virtually no immunity. That process — involving paperwork, approval through several agencies and a licensed carrier — normally takes several months, according to Dr. Larry Kerr, the director of pandemics and emerging threats at the Department of Health and Human Services. But more than one year after a devastating wave of H7N9 infections in Asia — 766 cases were reported, almost all in China — the Centers for Disease Control and Prevention is still waiting for several viral samples, the National Security Council and the W.H.O. confirmed. Scientists at the Department of Agriculture have had such difficulty obtaining flu samples from China that they have stopped requesting them altogether, according to a government official who spoke anonymously because he was not authorized to discuss the matter. The Chinese embassy in Washington did not respond to multiple requests for comment. The Chinese Center For Disease Control and Prevention also did not reply to inquiries regarding the transfer. When the H7N9 virus first appeared in China, researchers say the Chinese government at first provided timely information. But communication has gradually worsened. Yet a sudden spike in infections during the 2016-2017 outbreak wave demands intense research, said scientists aiming to understand the virus’ evolution. Recent trade tensions could worsen the problem. The Office of the United States Trade Representative in April released a proposed list of products to be targeted for tariffs — including pharmaceutical products such as vaccines, medicines and medical devices. So far, none of those medical products have landed on the final tariff lists. But lower-level trade negotiations with China concluded on Thursday with few signs of progress, increasing the likelihood of additional tariffs. The United States relies on China not only for H7N9 influenza samples but for medical supplies, such as plastic drip mechanisms for intravenous saline, as well as ingredients for certain oncology and anesthesia drugs. Some of these are delivered through a just-in-time production model; there are no stockpiles, which could prove dangerous if the supply was disrupted, health officials said. Scientists believe top commerce officials in both governments view the viral samples much like any other laboratory product, and may be unfamiliar with their vital role in global security. “Countries don’t own their viral samples any more than they own the birds in their skies,” said Andrew C. Weber, who oversaw biological defense programs at the Pentagon during the Obama administration. For over a decade, epidemiological data and samples have been used as trade war pawns. China hid the 2002 outbreak of severe acute respiratory syndrome, or SARS, for four months and then kept the findings of its research private. Some provinces withheld information about cases even from the central government in Beijing. In 2005, Chinese authorities insisted an H5N1 influenza outbreak was contained, contradicting University of Hong Kong scientists who offered evidence that it was expanding. Those authorities hesitated to share viral samples from infected wild birds with the international community, concealing the scope to avoid a hit to their vast poultry industry. Indonesia followed suit, refusing in 2007 to share specimens of H5N1 with the United States and United Kingdom, arguing that the countries would use the samples to develop a vaccine that Indonesians could not afford. Those episodes led to the 2011 development of the W.H.O.’s Pandemic Influenza Preparedness Framework, which aims to promote sample exchanges as well as developing countries’ access to vaccines. But for countries like China, bearing the burden of a novel virus is paradoxical. Outbreaks are expensive — the wave of H7N9 infections in 2013 alone cost China more than $6 billion, according to the United Nations — but they can provide a head-start in developing valuable treatments. “In a sense, China has made lemonade from lemons — converting the problem of global infectious disease threats into lifesaving and valuable commodities,” Dr. Callahan said. And now, as the H7N9 virus evolves, United States authorities worry that the Chinese have obfuscated the scale and features of this outbreak. The Chinese government has refused to share clinical data from infected patients, according to scientists, and claims to have all but eradicated H7N9 through a single poultry vaccination campaign. “Influenza is going to do what it does best, which is mutate,” Dr. Kerr said. 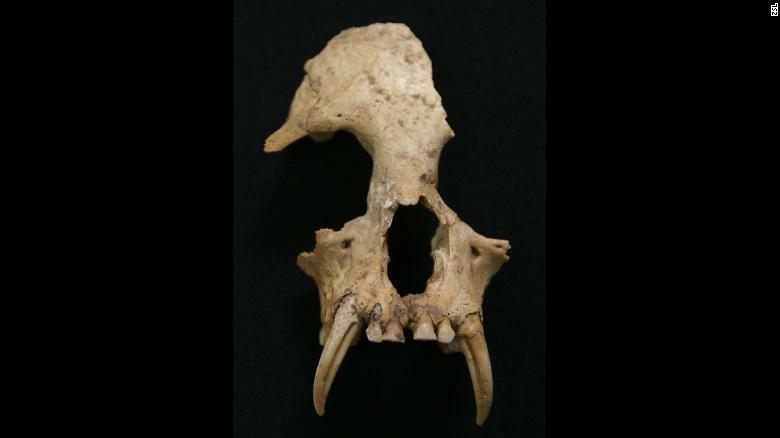 The piece of skull found in a Chinese royal tomb that uncovered the new genus of gibbon. (CNN) Researchers have uncovered the skull and jaw of a now-extinct, but never-before-seen genus of gibbon, which they’ve named Junzi imperialis. Importantly, the remains — which were uncovered from a 2,300-year-old Chinese temple — have evidenced the direct role of humans in Junzi’s extinction, the first extinction of its kind among primates, according to a new study published in the journal Science on Friday. 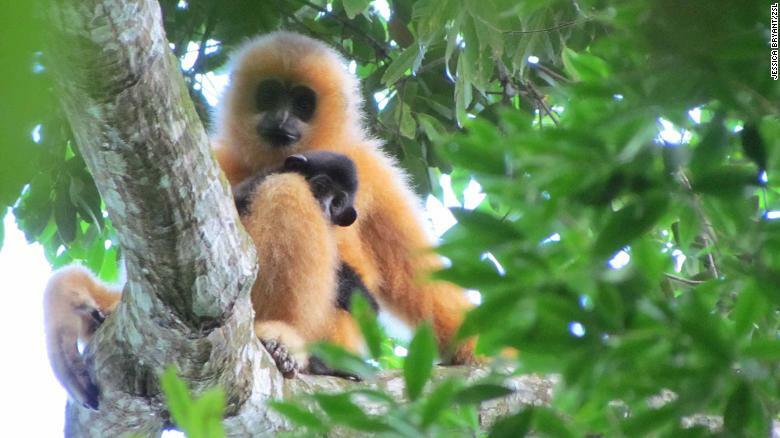 A female Hainan gibbon with an infant. The imperial Chinese revered gibbons. Many species have gone extinct. But since the end of the Ice Age, when humans started affecting species, there’s been no evidence of any human-driven ape extinctions, according to Hansford. “All the evidence points to humans being the dominating factor behind the loss of this species,” said Susan Cheyne, a director of the Borneo Nature Foundation, who is familiar with the study. A male Hainan crested gibbon. 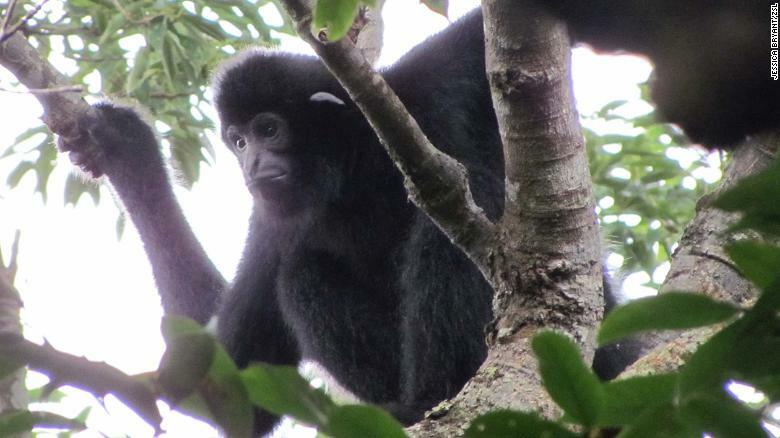 Gibbons may be the smallest of apes but their behavior and presence are striking. They sing loudly and melodically, have developed an elaborate language, and can swing from branch to branch at speeds of up to 35 mph. The bones were found at a royal temple in China in Xi’an, the capital of Shaanxi province, which was formally an important imperial city. The temple is thought to be the tomb of Lady Xia, the grandmother of the Qin dynasty’s first emperor, according to the study. The imperial Chinese revered gibbons, considering them regal members of the primate family — compared to monkeys, which were seen as rascally. As such, it was unsurprising to find these bones in a royal tomb, according to Susan Cheyne. Junzi means scholarly gentleman, and testifies to how the Chinese regard the primates. Gibbons are found across Asia, with several species — including the Hainan black crested gibbon and the Cao-vit crested gibbon — being threatened by imminent extinction. There are only 26 remaining Hainan gibbons in the world, according to Hansford. Hainan gibbons are found only on Hainan Island, China. 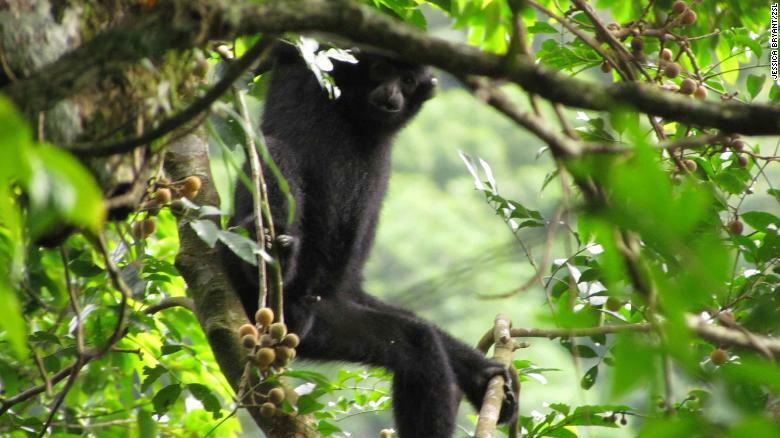 Living gibbon species are suffering more and more from both habitat loss and the illegal pet trade in Asia, according to Cheyne. “We now know almost exactly if we don’t deal with this double whammy of habitat destruction and hunting. Eliminating one without the other is not enough,” said Cheyne. Hansford hopes that we can use the study not only to inform the present but to improve it too.